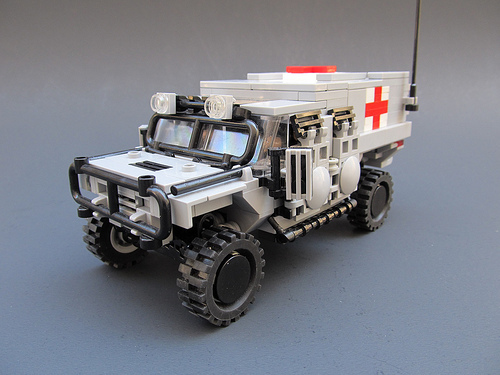 There’s a special place in my heart for Army ambulances built from LEGO. Andrew Somers has been posting variants of his Humvee-like Bulldog for a little while, but my favorite is the Medical Evacuation Variant. This beefy vehicle sports working suspension and opening doors. 10-wide isn’t my preferred scale for a vehicle in a world populated by minifigs, but they are pretty wide little people, so this scale allows Andrew to fit four minifigs in the cab plus two stretchers in the back. Um, it’s eight studs wide, not ten….